Sherwood's Notebook: 10, 9, 8, 7, 6, 5, 4...! The Notebook welcomes the New Year. Then again, what choice do we really have? Before we dive into 2015, let's take a look at the top stories of 2014, many of which still will be roiling in the coming days, weeks and months. 1. 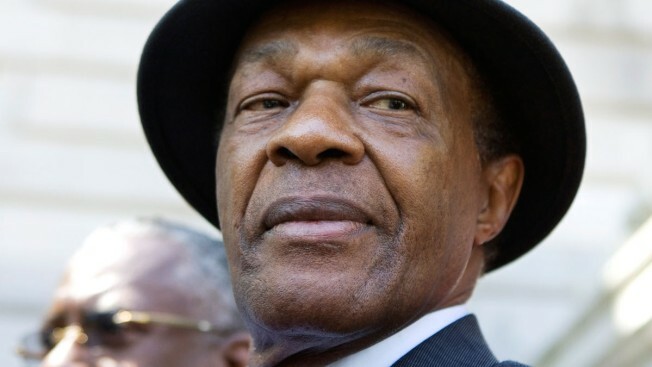 Marion Barry dies. Although his actual influence on city politics and the D.C. Council had waned considerably, Barry for good and bad defined much of local Washington to the world. But local D.C. is changing, with the rapid gentrification -- Manhattanization -- not only affecting our future but what we'll value years hence from our past. 2. Only the shadow knows. At long last, we may soon know the ultimate conclusion to the 2010 "shadow campaign" that helped elect Vincent Gray as mayor and planted the political seeds of corruption that destroyed his re-election chances last April. U.S. Attorney Ronald Machen is expected finally to decide what legal charges will be brought, moving Gray's shadow campaign's fate from the court of public opinion to a court of law. 3. Muriel Bowser wins. Back in 2012, Bowser was one of only three council members to suggest Gray should resign because of the shadow corruption case. (David Catania and Mary Cheh were the other two.) Bowser subsequently ran a cautious but well-disciplined campaign for mayor. Her era is just beginning with this week's inauguration. 4. Pot's highs and lows. The D.C. Council decriminalized marijuana possession (effective this past June) after advocates demonstrated the apparent racial bias of arrests among blacks and far fewer whites. The city already had provisions in place permitting medical marijuana. But when the voters in November overwhelmingly approved outright legalization of marijuana -- 65 percent voted yes -- Maryland Republican Rep. Andy Harris helped lead the successful effort (so far) on Capitol Hill to block implementation of Initiative 71. It's unclear whether in 2015 the city's attempt to use a unique interpretation of Harris' wording will revive the measure in the Republican Congress. 5. D.C. economy booms. Despite the loss of federal jobs throughout the region, the District is still attracting new jobs and new residents in record numbers. Chief financial officer Jeffrey DeWitt noted one startling statistic: Suburbanites used to hold 70 percent of the jobs within the District; they now hold 55 percent. 6. Housing and homelessness. Amid the plenty of a good economy, there are several trouble areas. Mayor-elect Bowser pledged again this week to aggressively address homelessness and the use of the old D.C. General shelter in particular. But housing is not just a homeless or low-income problem. As Washingtonian editor Michael Schaffer pointed out on WAMU, the city's middle-class residents also are being priced out of both rentals and homeownership. 7. New faces, familiar faces. After special elections in wards 4 and 8 this coming April, five of the city's 13 council members will be new. Additionally, three of the current members are pretty new (at-large members David Grosso joined in 2013 and Anita Bonds in 2012, and Ward 5's Kenyan McDuffie in 2012). How that will affect city politics is uncertain. New members tend to be more liberal than those who have been seasoned by serving (for better or worse). 8. A streetcar named delay. The District already has been handing out $100 tickets for blocking the H Street NE streetcar line. Too bad that, as of this writing, not one customer has actually ridden it. Are streetcars the future in the District? (The idea fizzled in Arlington.) Traffic is not getting better in D.C. even as it lurches toward a more equitable use of roadways for all -- bicycles, vehicles and pedestrians. 9. Soccer. But the 'Skins? Mayor Gray barely got his soccer stadium deal done before his term ends Friday. He had to depend on changes made by Mayor-elect Bowser (whom Gray, though a fellow Democrat, never endorsed). Details of the land swaps and financing to make the stadium a reality will unfold into 2015. But as of now, Ward 2 Council member Jack Evans likes to say, the major professional teams that use "Washington" or "D.C." in their names all play in Washington, except for the NFL team. Despite the lousy record of the football team and controversy over its name, Evans and others still see a good chance the team will return to the RFK site. 10. No boundaries on education. Whether it's sports, economic development, housing, jobs or anything else in life, it all can be affected by education. The District has been on an education reform track since Mayor Tony Williams. It was jet-propelled by Mayor Adrian Fenty, and Gray has kept it up. The next hurdle is the redrawing of neighborhood school boundaries. Mayor-elect Bowser said she would review and possibly revise the controversial rewrite that Gray's administration drew up. How that plays out may turn out to be one of the biggest issues Bowser faces.